A paper published today in Quaternary Science Reviews reconstructs Arctic temperatures in Kamchatka, USSR over the past 4,500 years and finds the highest reconstructed temperatures were about 3.8°C warmer than modern temperatures. The authors find "the highest reconstructed temperature reaching 16.8 °C between 3700 and 2800 years before the present," about 3.8°C above "modern temperatures (∼13 °C)." In addition, the data shows temperatures between 2500 - 1100 [during the Medieval and Roman warming periods] were about 1-2°C above modern temperatures of ~13°C. The paper adds to many other peer-reviewed papers demonstrating that there is nothing unusual, unnatural, or unprecedented regarding modern Arctic temperatures. Graph on left side shows reconstructed July temperatures were 1-2°C higher than modern from 2500-1100 years ago [during the Roman and Medieval warming periods], and up to 3.8°C higher than modern from 3700-2800 years ago [during Egyptian and Minoan warming periods]. Second graph from left shows similar changes in Greenland ice core data. This study presents a reconstruction of the Late Holocene climate in Kamchatka based on chironomid remains from a 332 cm long composite sediment core recovered from Dvuyurtochnoe Lake (Two-Yurts Lake, TYL) in central Kamchatka. The oldest recovered sediments date to about 4500 cal years BP. Chironomid head capsules from TYL reflect a rich and diverse fauna. An unknown morphotype of Tanytarsini,Tanytarsus type klein, was found in the lake sediments. Our analysis reveals four chironomid assemblage zones reflecting four different climatic periods in the Late Holocene. Between 4500 and 4000 cal years BP, the chironomid composition indicates a high lake level, well-oxygenated lake water conditions and close to modern temperatures (∼13 °C). From 4000 to 1000 cal years BP, two consecutive warm intervals were recorded, with the highest reconstructed temperature reaching 16.8 °C between 3700 and 2800 cal years BP. Cooling trend, started around 1100 cal years BP led to low temperatures during the last stage of the Holocene. Comparison with other regional studies has shown that termination of cooling at the beginning of late Holocene is relatively synchronous in central Kamchatka, South Kurile, Bering and Japanese Islands and take place around 3700 cal years BP. From ca 3700 cal years BP to the last millennium, a newly strengthened climate continentality accompanied by general warming trend with minor cool excursions led to apparent spatial heterogeneity of climatic patterns in the region. 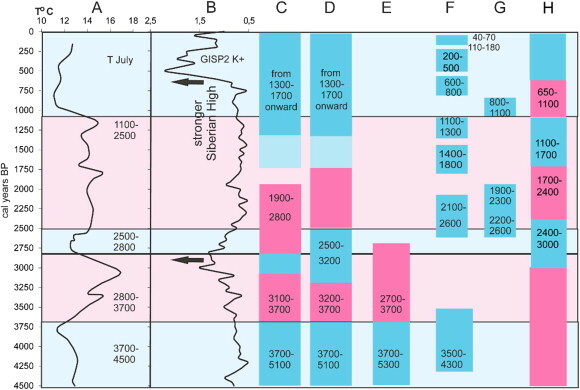 Some timing differences in climatic changes reconstructed from chironomid record of TYL sediments and late Holocene events reconstructed from other sites and other proxies might be linked to differences in local forcing mechanisms or caused by the different degree of dating precision, the different temporal resolution, and the different sensitive responses of climate proxies to the climate variations. Further high-resolution stratigraphic studies in this region are needed to understand the spatially complex pattern of climate change in Holocene in Kamchatka and the surrounding region. ► We investigated fossilized chironomids in lake sediment core from Central Kamchatka. ► We reconstructed late Holocene climate variations using chironomid inference model. ► Before 3.7 cal ka BP reconstructed TJuly are close to present day temperatures. ► Between 3.7 and 1.1 cal ka BP two warm stages are reconstructed. ► After 1.1 cal ka BP lower than present day TJuly are reconstructed. is kamchatka in the arctic? The Northern portion is 65 degrees N, within 1 degree of the polar circle, so in a strict sense it is just south of the Arctic circle, although many online descriptions characterize it as having an Arctic climate and Arctic wildlife. bit of a stretch to say arctic, just saying. It is actually the onset of the MWP at 1100 BP that is the cause of the Arctic cooling.